The government gets festive and so do the inmates. camera (Courtesy Daniel Genis) Daniel Genis and fellow inmates observe Thanksgiving with a turkey in prison in 2008. Daniel Genis' Thanksgiving dinner specialty was always fried mackerel. Not the most traditional dish, to be sure, but nor were the circumstances traditional: he was celebrating the holiday in prison. Convicted of five counts of armed robbery, Genis spent 11 Thanksgivings behind bars before being released in 2014. He said the holiday was one of the best days of the year for inmates -- an annual, culinary-fueled ceasefire during which traditional prison rivalries were set aside and everybody cooked and shared their food. “Thanksgiving was always a hit,” he said. Genis told ABC News that the real celebrations aren't focused around the prison-issued meals, but ones that the inmates work together to cook and serve themselves. “It becomes a friendly competition,” said Genis, now 40. “The one thing that never happens on any other day in prison is that the different racial groups share their food because in prison, especially in the maxes [maximum security prisons], who[m] you break bread with is taken quite seriously,” Genis said. And the fact that people actually put aside their prejudices and share on this day, is really amazing. It’s like, 'wow, Thanksgiving actually works.' I always found it really touching. That sentiment was echoed by “Prison Food in America” author Erika Camplin. “For holidays and celebrations, it’s a time when a lot of the frustrations and sort of lines between gangs or race get dropped and inmates let it go and they just come together to celebrate,” Camplin said. “Food brings people together," she said. "I think Thanksgiving is the most agnostic holiday in prison, so everyone celebrates it." Genis said that more inmates save and spend more money in the prison commissary and in catalog shopping to prepare a big meal than for any other holiday. “People save up all year,” he said, describing how smoked turkeys or other specialty items would be ordered from catalogs geared toward prisoners. "I made it many times, frying it in a huge tuna fish can, or my illicit work -- on top of a heating coil removed from a plastic hot pot," Genis said. Cooking capabilities were location-dependent, Genis said. In maximum security facilities, prisoners would reconfigure the few electronics they were allowed in their cells to help create new cooking tools, and then porters would pass plates back and forth to cells so prisoners could sample the various dishes inmates made. 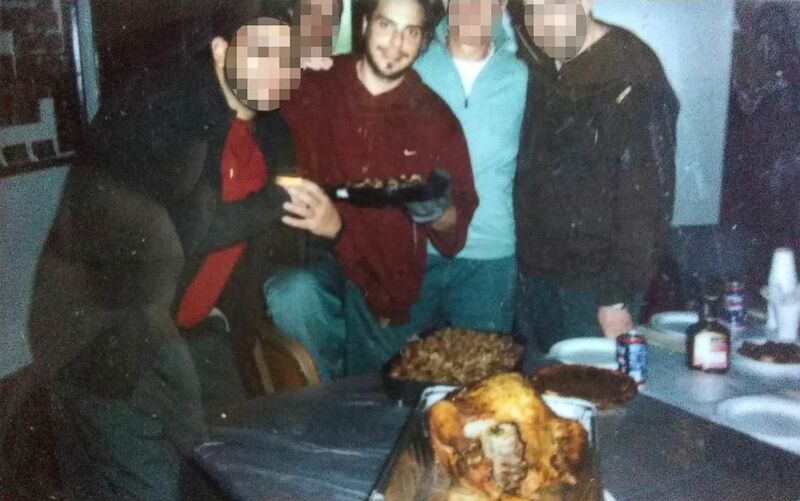 His most luxurious prison holiday was Thanksgiving, 2008 -- when he and other prisoners arranged to have a rabbi bring in a turkey that they paid for -- to help them secure the use of the institution’s oven for a few hours. 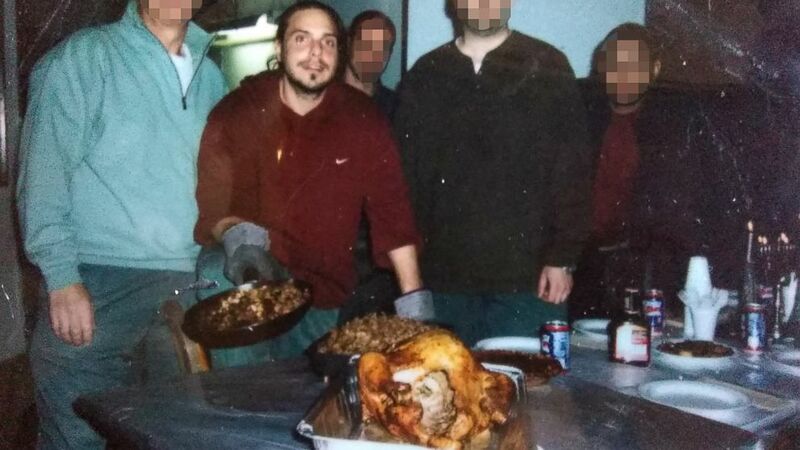 (Courtesy Daniel Genis) Daniel Genis and other inmates observe Thanksgiving with a turkey in prison in 2008. These makeshift potluck meals supplement the state-issued menus, which differ by state but tend to include the staples of turkey, gravy and cranberry sauce. This year, according to a spokesperson for Oklahoma’s Department of Corrections, state prisons there will serve green bean casserole, mashed potatoes and corn as sides. 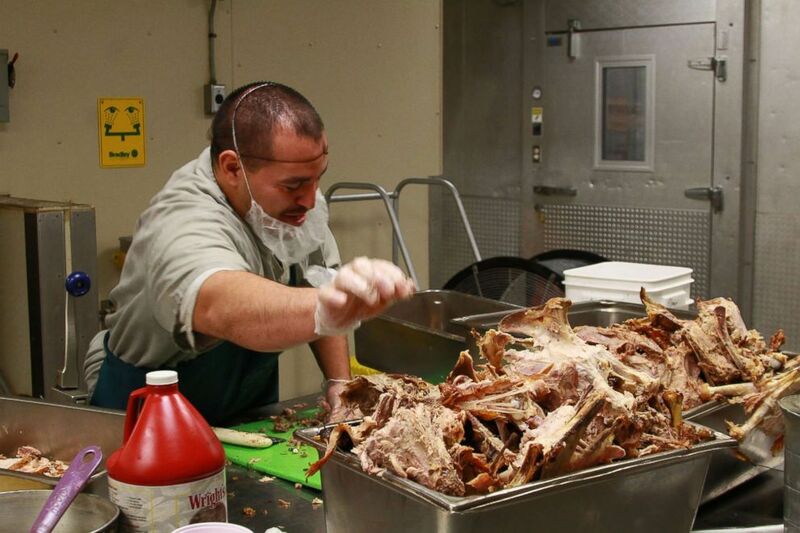 (Oklahoma DOC) An inmate helps prepare the Thanksgiving dinner at Joseph Harp Correctional Center in Oklahoma in 2017. California prisoners will have stuffing and either sweet potato or pumpkin pie, “depending on what the institution gets,” as well as ice cream and other desserts, said Bill Sessa, the spokesman for the California Department of Corrections and Rehabilitation. The menu for Thanksgiving in New York prisons includes bread dressing and sliced carrots in addition to the same staples as others. The timing differs slightly for different prison systems, as it will be Thanksgiving lunch for New York inmates, but turkey time won’t come until dinner in California because that prison system serves hot meals at breakfast and dinner while lunch is a bagged and cold. In Hawaiian prisons, the festive food is spread out a bit more, with baked ham in a pineapple glaze at lunch along with pumpkin pie and a seasonal side, which could be sweet potatoes or candied yams, and then at dinner the traditional roast turkey is served, along with stuffing, gravy, mashed potatoes, corn and dessert. 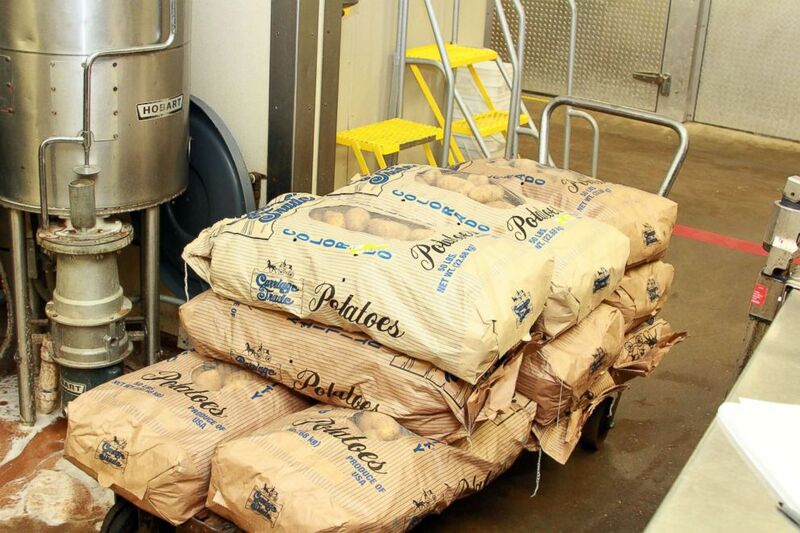 (Oklahoma DOC) Bags of potatoes sit before the Thanksgiving dinner at Joseph Harp Correctional Center in Oklahoma in 2017. “Generally speaking, I think Thanksgiving -- just like all prison food -- varies widely and deeply between different prisons and institutions,” Camplin said. “It’s inconsistent and it can, depending on the facility you’re in, it can be very special and they can go all out or it can be terrible and depressing,” she said. Camplin said that on the generous end of the spectrum, she has heard of wardens giving inmates almost a half turkey each. By contrast, one example Camplin pointed out Joe Arpaio, Arizona’s former Maricopa County sheriff, who boasted in a 2013 tweet that the Thanksgiving meal for those in his care only cost the state 56 cents per person. Genis said that the potluck meals are almost viewed as “edible protests” against what the prisoners think are, put nicely, less-delicious options provided by the state. “If the state meal is way of saying ‘you guys don’t deserve a real Thanksgiving,’ the prisoners meal is a way of saying ‘we do,’” he said.